Baby Robots are super cute with a diaper and binky in pink, blue or yellow. 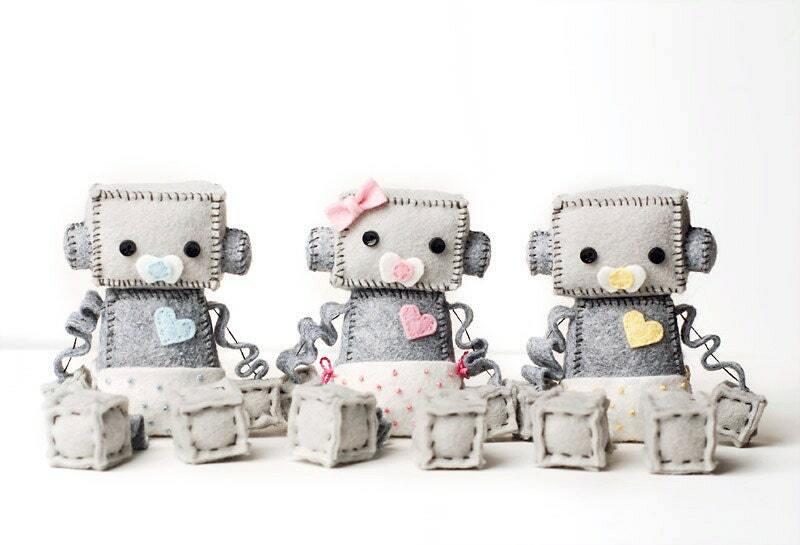 A little baby robot would make the perfect baby shower gift for decor for your robot nursery or geek chic nursery. This listing is for one robot! Pick which robot you would like. The pink girl robot comes with a bow automatically, however let me know if you want the blue or yellow robot to have a bow. Their diapers have darling French knots decorating the front and they have a matching heart. Robot is about 4 inches tall sitting. It is made of premium wool felt, cotton embroidery floss and little plastic buttons for eyes. Robots are all handmade by me and one of a kind, so expect slight differences. Stuffed plush robots are not for young children. They are carefully made, but are really for display only. Keep in mind that colors may vary slightly from what is displayed on your computer screen. Arms and legs are not poseable. Robot doesn't stand by itself. Designs (including robot design), tags, descriptions, and photos are protected by copyright. This steampunk robot is sooooooo cute!! Thanks Susie! I love this! It’s so adorable and tiny and cute! It has such detail and well put together. Definitely going to get another to keep him company! I wish I could give more than 5 stars. I cannot express how happy I am with this little guy!! I requested a custom modification (adding a mohawk) to the robot and he came out so perfect, I can't help grinning everytime I see him sitting on my husband's desk. My kids have named the little guy 'Daddy-bot' since he looks like my husband. Thank you so much! !